Whatever it is that you value most highly, whatever morals, ethics, or character, whatever lifestyle, if you want to pass it on to your children, they need to see you living it out. 7 Things Your Child Needs to See You Do. 1. If we want to nurture value for literature and knowledge then our children need to see us reading. Maybe a big thick book or two in between the magazines; the news, a documentary or nature program in between our usual shows; a tab with another kind of site in between facebook and sales sites. 2. Is exercise important? Then they need to see us doing it! It’s not about squeezing it in while they’re sleeping or while they’re at school, it’s about them seeing us leave and return, seeing sweat, seeing our sit ups or waving as we run past the window. We started something a while ago at our house when either of us returns from any kind of exercise what-so-ever, the other one says ”WELL DONE!” when we return… And it stuck! It’s not just cute and funny, it actually is even really encouraging when your three year old runs up and says ”WELL DONE MAMA!”, ”WELL DONE PAPPA!”. 4. Putting down our phone! Have you seen the clip Put Your Phone Down? If our children are to believe that life is what happens in the here and now then they need to see us living life and enjoying it, not our outstretched mobile. 5. Self worth, self value, self-esteem, belief in yourself. Our children need to see us valuing ourselves, our innate value as a human being . They need to see demonstrations of our belief in ourselves. See us daring to try new things and venture into the unknown. See that we have hope and belief that we will succeed. 6. Kindness and generosity. Not just spending time with our closest family and friends at Christmas and buying them presents. What small acts of kindness and generosity is your child seeing you do? Who are you helping? If giving is important, then let your child know that you do that, an automatic money transfer each month that you never talk about is nothing that shapes them. 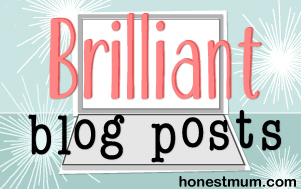 Vicki @HonestMum wrote a post recently about random acts of kindness – see her post here. 7. Seeing us fail or fall short, and seeing our response to that… that it’s ok! That we’ve learned something, that we know how not to do it next time. Seeing us try again! …What’s important for you? It’s time to get real and be creative! If it’s morals and values, how can you make them tangible? What could they look like in praxis? If you want to do your part to take care of and sustain our environment, what can you do about that, with your children (check out the clip below); if it’s treating all people as equals, with value and respect, how do you want to show your children that? It’s January, one of the most optimistic months of the year, but really any time is the right time to start to be an example. Is there something you would add? Sharing is caring, I welcome your comments. – A little disclaimer: It is not me in the picture above! What a great great post ! thank you for linking up ! What a great post Steph! I wholeheartedly agree with all of this! We really try to let our daughter (who’s 2 1/2) see us working out or workout with us. I think health and fitness is so important these days. Especially in America with so many overweight and obese kids. I could go on and on but I agree with it all! 🙂 Fabulous post! What a wonderful post Steph! I’m guilty for getting the exercise in before the kids wake up. Never thought of the importance of them seeing me exercise… such a good point. My other thing that I would add is for them to see me actually reading the Bible. So many times I read my Bible on my phone or the iPad. It didn’t dawn on me until recently that they have no idea I’m reading God’s word! It’s critical for them to see that reading the Bible is a constant and important part of my life. 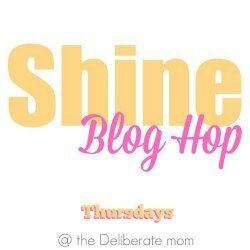 Thanks for sharing and thanks so much for co-hosting this week’s #SHINEbloghop with me. It’s been lovely working with you! Wishing you a wonderful weekend. Have fun camping! Thanks Jennifer! Lovely reflections… Though I’m also thoroughly impressed that you’re exercising before they wake up too 🙂 No need to change a working routine – you could just throw in a few sit-ups after they’ve woken up! What I love about exercising when the kids are awake and around is that they always love to join in. So there they are with their tiny feet (not so) wedged under the sofa doing their sit-ups too. I love this post. Kindness and generosity is something important to us. I try to tell my daughter to be kind to at least one person a day. Its what people will remember her by. For us, its about teaching my daughter the value of family time. We spend so much time outdoors together trying new things and having adventures. I believe it has made her a confident little girl who isn’t afraid to try something. A lovely post, glad I had the chance to see it. These are all great examples of role modelling behaviour to our kids. I am so happy to have an excuse to read in front of my daughter but I also try and do the same with writing. I do most of my writing on the laptop but am conscious that if I want my daughter to recognise the importance of writing then I must write in front of her too.